Taylor guitars are like the BMWs of the guitar world. They don’t look overly fancy or flashy, but they’re sleek, stylish and they handle like a dream. And I don’t know about you, but I wouldn’t think twice about giving up a toe or two to get my hands on one of Taylor’s masterpieces. In fact the only bad thing that I’ve got to say about their guitars is that they don’t come cheap. That said Taylor’s recently introduced 200 series guitars seem to address just that issue. Compared to most of Taylor’s higher-end offerings these guitars are much more affordable, and they still retain Taylor’s superior build and tonal quality. In fact, I feel that they offer more value for money than most other guitars from other manufacturers within the same price range. Today we take an in-depth look into the Taylor 214ce acoustic-electric guitar, which is pretty much the unofficial flagship guitar for Taylor’s 200 series. There’s no denying the fact that playing a high quality guitar adds a level of credibility to your playing, even if from a purely visual point of view. And the Taylor 214ce certainly looks the part. The guitar’s Sitka spruce top features a high quality gloss finish, but what really sets the 214ce apart in terms of aesthetic appeal is the gorgeous satin finish on the layered Indian Rosewood sides and back. The ebony fretboard also really adds to the guitar’s sleek look and feels great on the fingers. Laminate wood construction is the only querulous part in the 214ce DLX setup. One of the archetypes of the Taylor guitars, it gets you where you want to be with ease. Sitka spruce along with layered rosewood and Sapele neck, the ebony fingerboard, and rosewood veneer headstock is what this beauty is made of. What I love about the 214ce’s grand auditorium body is that it offers the depth and richness of a traditional dreadnaught sound, but still manages to look and feel much slimmer. Technically, the 214ce’s body has the same length and width of one of Taylor’s dreadnaughts, but you definitely feel the difference in handling in a sit-down live setting. The grand auditorium body style also helps sharpen the definition of each note, which makes the 214ce a great choice for a variety of playing styles. As far as the 214ce’s overall tone goes, it sounds just like you’d expect a high quality acoustic to sound, and does a remarkably good job of combining both tone depth and definition. The resonance of the solid Sitka spruce top blends in beautifully with that of the layered rosewood sides and back and produces a tone that is wonderfully open and rich at the same time. An all-around guitar with exceptionally high versatile capabilities is how this one can be defined. The lows are impeccable when either fingerpicked or flat-picked, highs, despite being acceptably bright and satisfyingly well-defined, lack a bit in harmonic complexity, even though only the most skilled of pros could notice it. On the other hand, the laminate in the sides and on the back helps greatly in the projection of sound, but with age, it may not be as promising as it would be the case if some other material had been used in the process of making. The 214ce features Taylor’s trademark ES-T electronics system which blends the resonance of the strings as well as that of the body, and does a remarkably accurate job of replicating the guitar’s acoustic tone when plugged in. As with most higher-end guitars, the pre-amp section does not feature a tuner and has a sleek and simple three knob control system to adjust bass, treble and volume with. The ES-T electronics system is powered by a 9V battery which is housed conveniently at the bottom of the guitar, leaving the top side of the guitar sleek and smooth. 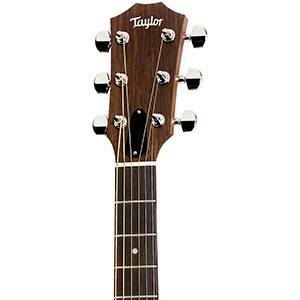 The Taylor 214ce is available in natural, black and sunburst finishes. Check out the chart below for more details. The great thing about Taylor guitars is that they come out of the factory pretty much ready to play. The 214ce that I tried out was setup beautifully and the action felt incredibly light without any string-buzz whatsoever. The 214ce also features Taylor’s high quality tuning machines which help the guitar stay in tune for ages, which is always an advantage for players that play long gigs. The construction quality, in general, is remarkable, as is known for Taylor guitars. The only reason one would have to question the durability is the laminated wood which the back and sides are composed of, but it affects neither the sound nor the grit of the guitar. The Taylor 214ce received a warm welcome on the music stage as soon as it came out. People like it, and for a good reason. Solid durability, majestic and rich tone, as well as decent consistency, are only some of the reasons the customers like it. It is also described to be best used while Jamming or practicing, but could easily shine in the spotlight of a smaller venue. Great acoustics are the result of excellent craftwork and the remarkable choice of materials. There are not many flaws this guitar possesses, but the few it has should also be taken into account. The laminated wood does pose a problem neither for sound or durability, but it ages at a slower and less promising rate. Considering the 214ce’s excellent build and tonal quality, you’d be hard-pressed to find a better instrument for the same price. It possesses a great deal of qualities, numbering versatility, playability, and durability. It is, perhaps, a bit more expensive than it might look, but looks can, and in this case, are deceiving, for the 214ce is worth its salt. Considering the 214ce’s excellent build and tonal quality, you’d be hard pressed to find a better instrument for the same price.